From Ho Chi Minh City to Sieam Reap, meander along the Mekong, receive a monk's blessing and discover the bright communities along the Tonle River. Meander along the Mekong and float by the lively floating markets of Cai Be, learn about Vietnam’s French-infused past, soak up the melting pot of cultures that is Phnom Penh and discover the bright communities embracing rural river life along the Tonle River. Siem Reap is home to the magnificent temples, ancient hydraulic systems and communication routes of Angkor, and still today the scores of temples and relics whisper secrets of the once-imposing Khmer Kingdom. Discover it all on this enchanting journey. Welcome to Ho Chi Minh City. You will be welcomed and taken to your meeting point, the Intercontinental Saigon. Please arrive at the hotel by midday. After lunch, travel by coach to My Tho to board the luxurious Scenic Spirit. Toast the start of your cruise with a cocktail reception. Journey along the mighty Mekong river on our 18-day luxury cruise and tour. 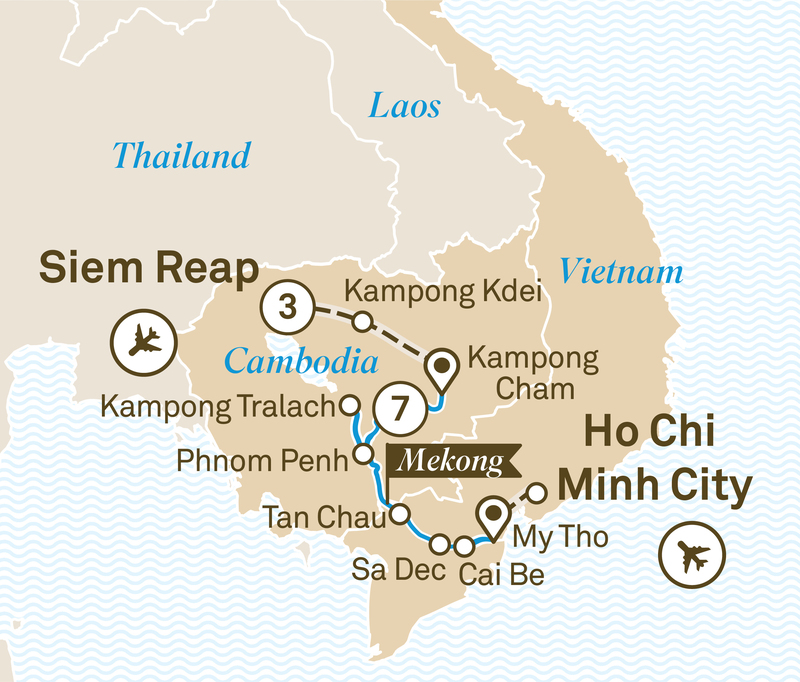 Highlights include Ho Chi Minh City, Phnom Penh, Siem Reap and Kampong Cham.